Want to have an unforgettable stay in the heart of Madrid? We are the hotel for you! Our team looks forward to meeting you and giving you the entire center of Madrid at your fingertips. The 4-star Mercure Madrid Plaza de España hotel is located in the heart of Madrid, close to Plaza de España and Gran Vía, near the Royal Palace and La Almudena Cathedral. The hotel has 97 rooms, which were all renovated last year and boast Internet access. Some rooms have a terrace. Enjoy our newly refurbished Vermutería Chipen bar, where you can try classic tapas dishes from Madrid with international twists. The Mercure Madrid Plaza de España hotel offers affordable luxury in the heart of the capital. Close to the major tourist attractions such as Plaza Mayor and Gran Vía, the hotel is ideal for family vacations or business trips. Why wait? Book now! Located just 5 minutes from Gran Via and 15 minutes from Puerta del Sol. Recent opening of the Vermutería Chipén bar. Hotel newly renovated in 2017. Free fitness center next to the hotel. Modern and bright room with double bed and additional single bed. Magnificent Suite with terrace and 79 in x 79 in double bed, feather mattress and pillows. I stayed here for a recent work trip to Madrid. The hotel is very well-situated, comfortable, and has a very friendly, courteous staff. 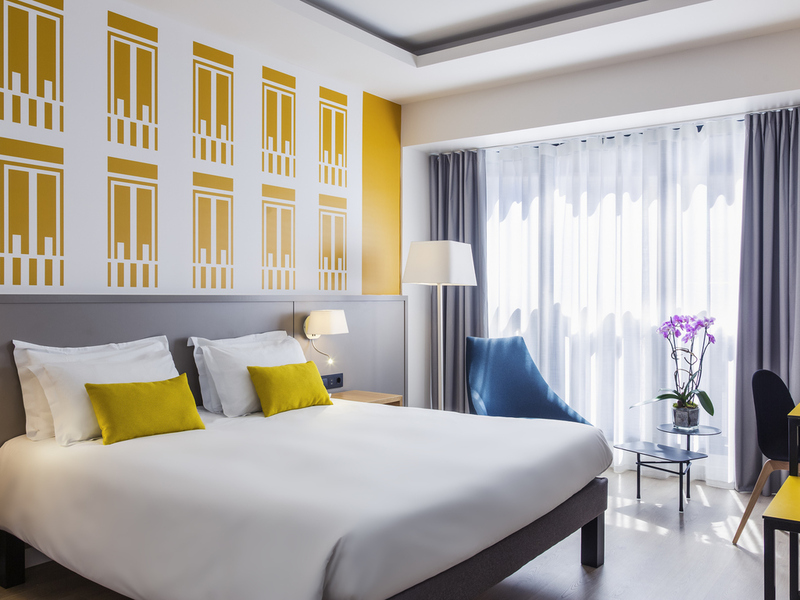 The hotel is close to everything in the centro area of Madrid and close to several metro stations, but you can also walk from it to nearly anywhere you want to visit in the centro portion of the city. The staff is very friendly, helpful and goes out of their way to help. Also, wifi is business class, very quick / reliable. A great stay, thanks! Dear Mr. M., Thank you very much for your comments. We hope to see you soon in our hotel!! Best regards. Héctor. Estimada Sra. Montserrat, Muchísimas gracias por su evaluación. Esperamos verle pronto en nuestro hotel!! Gracias y un saludo. Héctor. Dear Mrs. B., Thank you very much for your comments. We are try to change the concept of the breakfast, I wish the next time you will find it more pleasant. We hope to see you soon in our hotel!! Best regards. Héctor. The hotel was in a great location, staff very friendly and food very good. rooms are clean, service is friendly, Breakfast is good. However drinking water bottles should be offered as tap water contains chlorine and is not acceptable to drink. We enjoyed our stay in your hotel. The team is really nice & smiling. The hotel is well located. Very nice decoration. Dear Mr. A., Thank you very much for your comments.It is always a pleasure to welcome you at the hotel. We hope to see you soon in our hotel!! Best regards. Héctor. Dear Mr. F., Thank you very much for your comments. We hope to see you soon in our hotel!! Best regards. Héctor. OK but room too hot. Just OK. Room was too hot, air conditioning poor and window only opened a tiny bit. Key card for room stopped working several times. Bar area quite nice. Good location. Reception, Accommodation and breakfast were very good. Service was kind and friendly. Due to the connecting door, a very thin door, the neighbours kept me up at night. Mercure at Plaza de Espana is a good hotel, room was very clean confortable and the people at reception bar etc were professional and ready for every question by us. Dear Mr. P., Thank you very much for your comments. We hope to see you soon in our hotel!! Best regards. Héctor. Front desk personnel was very attentive and helpful for the check in and during the stay. Room was clean and better than expected. Estimado Sr. Morazo, Muchísimas gracias por su evaluación. Esperamos verle pronto en nuestro hotel!! Gracias y un saludo. Héctor. Very comfortable beds and nice bright room. I'm not sure the welcome pack and products provided in the provilidge room.can be classified as VIP. shame no notice was taken of my cousins birthday despite making a comment when booking the room. Breakfast had good quality products but it's only bread salami and cheese. Some kind of cucumber or fresh tomatoes would be nice. Dear Mrs. W., Thank you very much for your comment and for highlighting the friendliness of our team and the efficiency of all the services that we put at the disposal of our customers. We always try to do everything that is in our hands so that customers feel at home. Thank you and we hope to see you soon in the near future! Best regards. Héctor. At first it was not easy for me to find where the fridge was. Perhaps its a good idea to give a brief explanation of the room when a guest arrives. Dear Mr. C., Thank you very much for your comments. We hope to see you soon in our hotel!! Best regards. Héctor. An excellent visit with helpful staff and a well positioned hotel ideal for using the metro but still within walking distance of the royal palace etc. Ample breakfast with a good bed and would use the hotel again if returning to Madrid. Dear Mr. r., Thank you very much for your comment and for highlighting the friendliness of our team and the efficiency of all the services that we put at the disposal of our customers. We always try to do everything that is in our hands so that customers feel at home. Thank you and we hope to see you soon in the near future! Best regards. Héctor.